I am honored to be here today to address Dean Yingyi Qian, Tsinghua School of Economics and Management's distinguished faculty, proud family members, supportive friends, and most importantly, the class of 2015. Unlike my boss, Mark Zuckerberg, I do not speak Chinese. For that I apologize. But he did ask me to pass along this message -- zhuhe. I am thrilled to be here to congratulate this magnificent class on your graduation. When Dean Qian invited me to speak today, I thought, come talk to a group of people way younger and cooler than I am? I can do that. I do that every day at Facebook, since Mark is 15 years younger than I am and many of our employees are more his contemporaries than mine. I like being surrounded by young people, except when they say to me, "What was it like being at university without a mobile phone?" or worse, "Sheryl, can you come here? We need to see what old people think of this feature." I graduated from college in 1991 and business school in 1995. This was not that long ago. But I can tell you: the world has changed an awful lot in just 25 years. My business school class tried to have our school's first online class. We had to pass out a list of screen names because it was unthinkable to put your real name on the Internet. And it did not work because the system kept crashing -- it just wasn't possible for 90 people to communicate at once online. But for a few brief moments in between crashes, we glimpsed the future -- a future where technology would connect us to our colleagues, our relatives, our friends. The world we live in today is one I could not have imagined when I was sitting where you are. And 25 years from now, you will have helped shape your generation's world. But the fact is countries don't lead. People lead. At Facebook, we have posters on our walls to remind us to think big -- to challenge ourselves to do more each and every day. There are important leadership lessons reflected in these posters -- and today, I want to cover four of them that I think can be meaningful for you. It's unusual to find your passion as early as Mark. It took me far longer to figure out what I wanted to do. When I was sitting in a graduation robe, I could not have considered a job at Facebook because the Internet did not exist -- and Mark was only 11 years old. I thought I would only ever work for the government or a philanthropic organization because I believed these institutions made the world a better place while companies only worked towards profits. But when I was working at the U.S. Treasury Department, I saw from afar how much impact technology companies were having on the world and I changed my mind. So when my government job ended, I decided to move to Silicon Valley. In retrospect, this seems like a shrewd move. But in 2001, it was questionable at best. The tech bubble had burst. Large companies were doing massive layoffs and small companies were going out of business. I gave myself four months to find a job. It took almost a year. In one of my first interviews, a tech company CEO said to me, "I took this meeting as a favor to a friend but I would never hire someone like you -- people from the government can't work in technology." Eventually, I persuaded someone to hire me, and 14 years later, I still love working in tech. It was not my original plan, but I got there -- eventually. I hope if you find yourself on one path but longing for something else, you find a way to get there. And if that isn't right, try again. Try until you find something that stirs your passion, a job that matters to you and matters to others. It's a luxury to combine passion and contribution. It's also a clear path to happiness. Getting feedback from your boss is one thing, but it's every bit as important to get feedback from those who work for you. This is not an easy thing to do as employees are often eager to please those above them and don't want to criticize or question their higher-ups. One of my favorite examples of this comes from Wall Street. In 1990, Bob Rubin became the CEO of Goldman Sachs. At the end of his first week, he looked at Goldman's books and noticed large investments in gold. He asked someone why. The answer? "That was you, sir." "Me?" he replied. Apparently, the day before he had been walking around on the trading floor and he commented to someone that "gold looks interesting." This got repeated as "Rubin likes gold" and someone spent hundreds of millions of dollars to make the new boss happy. On a smaller scale, I have faced a similar challenge. When I joined Facebook, one of my tasks was to build the business side of the company -- but without destroying the engineering-driven culture that made Facebook great. So one of the things I tried to do was discourage people from doing formal PowerPoint presentations for meetings with me. At first, I asked nicely. Everyone ignored me and kept doing their presentations. So about two years in, I said, "OK, I usually hate rules but I now have a rule: No more PowerPoint in my meetings." About a month later I was about to address our global sales team, when someone said to me, "Before you get on that stage, you really should know everyone's pretty upset about the no PowerPoint with clients thing." I was shocked. I had never banned these presentations for clients! I just did not want them in meetings with me. How could we present to our clients without PowerPoint? So I got on the stage and said, "One, I meant no PowerPoint with me. And two, next time you hear a bad idea -- like not doing proper client presentations -- speak up. Even if you think it is what I have asked for, tell me I am wrong!" A good leader recognizes that most employees won't feel comfortable challenging authority, so it falls upon authority to solicit feedback. I learned from my PowerPoint mistake. I now ask my colleagues "What could I do better?" And I always thank the person who has the guts to answer me honestly, often by praising them publicly. I firmly believe that you lead best when you walk side-by-side with your colleagues. When you don't just talk but you also listen. Third, nothing is someone's else's problem. When I started my career, I observed people in leadership roles and thought, "They're so lucky. They have so much control." So imagine my surprise when I took a course in business school on leadership and was told that as you get more senior, you are more dependent on other people. At the time, I thought my professors were wrong. They were right. I am dependent on my sales team... not the other way around. If they fall short, it is my mistake. As a leader, what I can accomplish is not just what I can do myself but what everyone on my team does. Companies in every country operate in ways that are right for their cultures. But I believe that there are some principles of leadership that are universal -- and one of those is that it is better to inspire than to direct. Yes, people will do what their bosses tell them to do in most organizations. But great leaders do not just want to secure compliance. They want to elicit genuine enthusiasm, complete trust, and real dedication. They don't just win the minds of their teams, they win their hearts. If they believe in your organization's mission and they believe in you, they will not only do their daily tasks well, but they will do them with true passion. A friend of ours named Bill Gurley, a leading venture capitalist in Silicon Valley, wrote a post where he urged others to "Be Like Dave." Bill wrote, "Dave showed us all exactly what being a great human being looks like... But it was never frustrating because Dave's greatness was not competitive or threatening. It was gentle, inspirational and egoless. He was the quintessential standard for the notion of leading by example." Harvard Business School Professor Frances Frei has said "leadership is about making others better as a result of your presence and making sure that impact lasts in your absence." Like Dave, you can do this for others over the course of your career. As the Chinese proverb holds -- "women hold up half the sky." This is quoted all over the world and women have a special role in China's history and present. When the world has gathered to discuss the status and advancement of women, we've done it here in Beijing. In 1995, the Beijing Declaration and Platform for Action -- which called for women's full and equal participation in life and decision-making -- was adopted by 189 governments. Last year, on the 20th anniversary of that historic declaration, leaders again gathered here to mobilize around what has become known as the promise of Beijing: equality for women and men. Yet while we all acknowledge the importance and strength of women, when we look at leadership roles in every country, they are overwhelmingly held by men. In almost every country in the world -- including the United States and China -- less than 6 percent of the top companies are run by women. Women hold fewer leadership roles in every industry. This means that when it comes to making the decisions that affect all us, women's voices are not heard equally. There are many reasons for the gender leadership gap -- outright discrimination, greater responsibilities at home, a lack of flexibility in the workplace, and importantly, our stereotypical expectations. While cultures differ all over the globe, our stereotypes of men and women are remarkably similar. Although the status of women is changing and evolving in China and many parts of the world, traditional expectations and stereotypes linger. To this day, in the U.S., in China, and everywhere, men are expected to lead, be assertive, succeed. Women are expected to share, be communal, acquiesce to others. We expect leadership from boys and men. But when a little girl leads, we call her "bossy" in English, or qiang shi in Chinese. Other social barriers also hold women back. Women are often excluded from professional networks -- like Guanxi -- and both formal and informal socializing that is critical for job advancement. This is also true in the United States, where men often chose to mentor other men instead of women. I believe that the world would be a better place if men ran half our homes and women ran half our institutions -- and the good news is that we can change the stereotypes and get to real equality. We can support women who lead in the workforce. We can find more balance in the home by fathers helping mothers with housekeeping and childrearing; more equal marriages are happier and more active fathers raise more successful children. We can walk up to someone who calls a little girl "bossy," and say instead, "That little girl is not bossy. That little girl has executive leadership skills." And I want to make this very clear: Equality is not just good for women. It's good for everyone. Female participation in the workforce is a major driver of economic growth. Companies that recognize the full talents of the entire population outperform those that do not. AliBaba CEO Jack Ma, who stood here last year, has said that "one of the secret sauces for Alibaba's success is that we have a lot of women... without women, there would be no Alibaba." Women hold 40 percent of all jobs at Alibaba and 35 percent of senior positions -- far more than most companies anywhere in the world. Great leaders don't just develop people like them, they develop everyone. If you want to be a great leader, you will develop the women -- as well as the men -- at your companies and on your teams. The first international Lean In Circle I ever met with was in Beijing -- a group of young professional women who gathered to support each other's professional ambitions and challenge the idea of "shengnu," leftover women. In the past two years, they have built a network of Circles throughout China from working professionals to university students -- women and men who come together to support equality. One of these Circles is at Tsinghua, and I met with them earlier this morning. I was inspired by their passion for their studies and their careers. 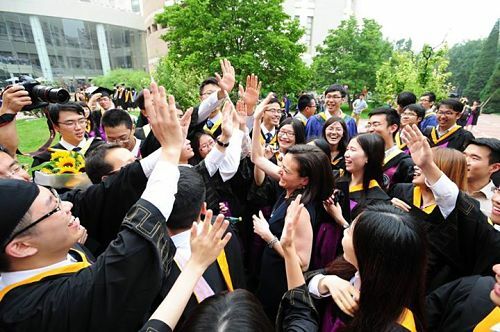 As one member told me, "It was when I first joined Lean In Tsinghua that I began to fully understand the Chinese proverb, 'A just cause enjoys abundant support.'" This is a day of gratitude. A day to thank the people who helped you get here -- the people who nurtured you, taught you, cheered you on and dried your tears. Today is a day of reflection. A day to think about what kind of leader you want to be. 3. That you empower everyone. Nothing is somebody else's problem.